Hello Crafty Friends... I have a video tutorial for you all today! 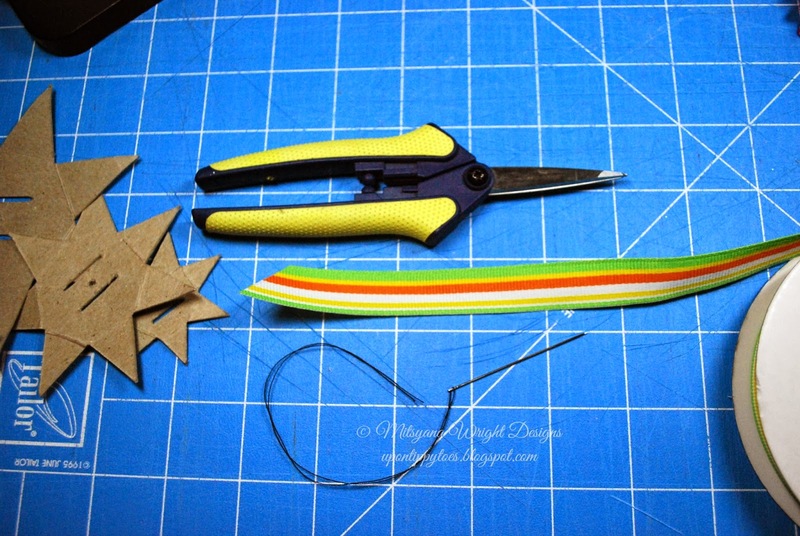 I'll be teaching you how to make a seven pointed star bow. I will include the link to download your very own template I used in the video tutorial below. This file is in SVG format especially made for those of you who have an electric/ digital cutter. I also be doing another giveaway... I will be giving away 3 template sets to 3 lucky individuals. To enter just leave a comment in the comments section of my youtube video. 3 winners will be chosen at random. I'll will choose winners Sunday evening and announce them Monday on my blog. 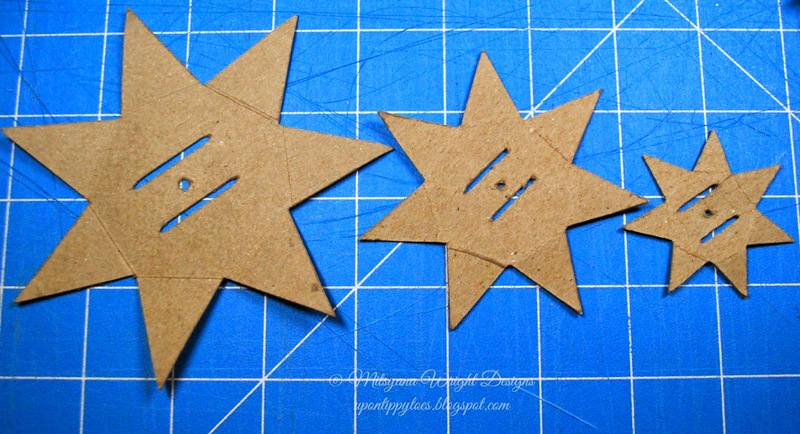 You can download the SVG file for the 7 pt star bow template and cut it out from chipboard , stencil film, or craft plastic. My test templates I made out of chipboard and they worked great, but I wanted something a little more stable that wouldn't get worn out as quickly. So, I cut them from stencil film. Perfect... cut perfectly and very flexible! As a beginner it's best if you start with the biggest template and as you get the hang of the technique work your way down to the smaller ones. Don't forget I'm giving away sets of these templates and all you have to do is leave a comment on my youtube video. I am new to doing videos... so, please be kind and leave a nice comment. I don't know much about video making or editing and positive feedback would be encouraging. Thanks & I hope you enjoy! If you can't see it here click here to view it on youtube. P.S.- The video does talks about 3 loops around each point to get the look in the picture below. But if you wanted a more fuller or more closed center try 4 or 5 loops around each point. I like putting buttons in my center and that is why I stopped at 3. And there you have it... SUPER CUTE BOWS!! You can download the SVG Format of the template HERE. 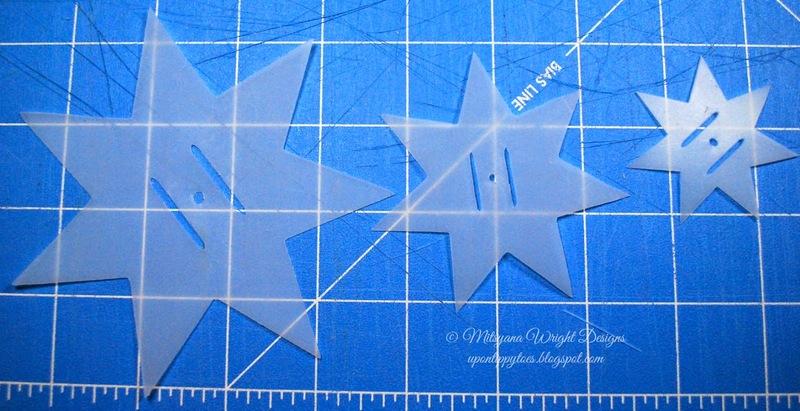 I have the set made of stencil plastic, and I love that I can now make bows using only the stencil and needle and thread! 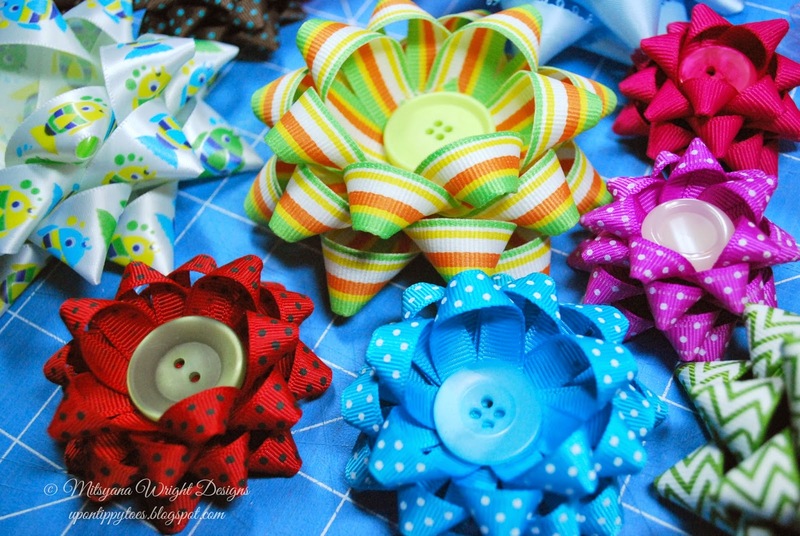 I have the bow maker you buy at the fairs, and it's hard to buy the pins for them, and you have to use special ribbon that doesn't shred with them. With this template, you just make a new one when the old one wears out, and you can use any ribbon, and you don't have to wait to the next fair to buy more stuff to make your bows! YAY! Is there a certain setting you have to have your printer at to print them out? They look small when I print them out. I can't wait to make them but the templates are small. What are the measurements on each star? Thanks!! I have tried to change the size for my printer but have not had any luck getting it to print out right :( do you know what I should set it as to get it to work? Hi Mrs Hubbs, this file is SVG format and is meant to be used with an electronic cutting machine. If you would like I can send you a JPG version of my file. Please message me with your email address and I can send that right to you. Hi mbyrd22, Please check your email. I have sent you the jpg version. Hi Mitsyana, Thank you so much for sharing with us. I have no eletronic cutting, but I will be trying it doing manual, because I love to learn everything a bit. I wish you a blessing week. Excellent video, you did a wonderful job. Loved watching it and encouraged to try it. Thank you so much Judy! I'm so glad you enjoyed the video! Hope you have a beautiful day! please send me jpeg thanks! I would love an email with the jpeg version! Please check your email. Templates have been sent. Could you please send me a copy of the jpg, too? Hi Wanda... I would gladly send you the jpg. Can I please have your email address? Oops, yes. :) wivavoice@gmail.com Thank you so much. Hi Jane, the link to the template is above the picture with the ribbon, scissors, and needle & thread in it... it should be highlighted. If you are still having problems please let me know. That’s so great of you to give us the template!! 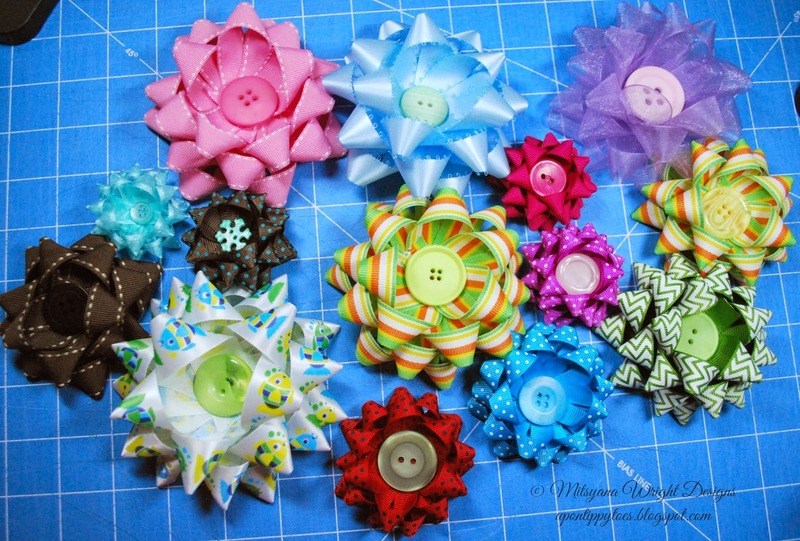 I cant wait to make these and especially the bows!